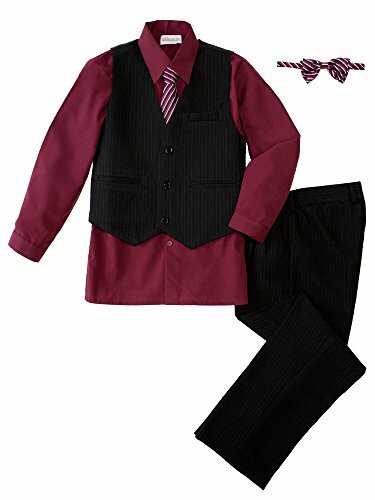 Outfit includes vest, shirt, pants, necktie and bow tie. Pinstripes polyester vest. All styles have black vest except for the Grey and Victoria Blue. Grey suit has grey vest and Victoria Blue has navy vest. Matching pinstripes pants with elastic waist. Pants have side pockets and one back pocket with button closure. Dress Shirt - 35% Cotton and 65% Polyester. Made in Indonesia.